The Geminid Meteor Shower doesn’t usually get the full-court press offered to the two other notables, namely the Leonids and the Perseids. 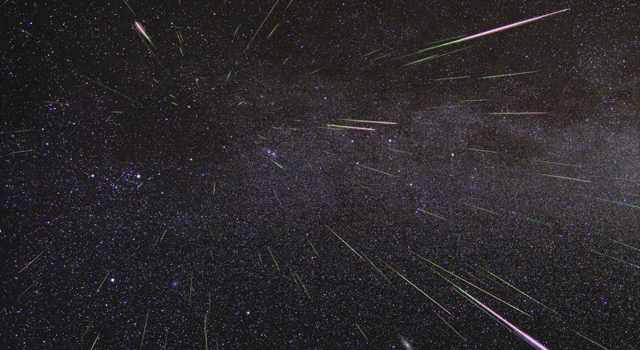 However, recent studies point to an expected increase in meteor shower activity from the Geminids that will continue for the next few decades. Why? Jupiter’s gravitational influence is going to steadily push more of the stream of ejected material from the extinct comet Phaeton our way over this course of time. Fortunately, we don’t have to worry about Phaeton slamming into us, which is now technically just an asteroid. At worse, about 100 streaks an hour can be expected starting around midnight local time in North America. Start by finding Orion, look at his arrow-wielding arm, follow it “up” until you reach the constellation Gemini. That’ll be where it appears the shower is coming from. What of the prediction of increased shower activity? At they high end, you’re looking at possibly 200 streaks an hour. Wow!